Rhynchoglossum are perennial or annual monocarpic (fruit once and then die) herbs, broadly distributed from India and south China to New Guinea, with one (or possibly as many as three) species in Central America (Mexico, Colombia, Venezuela). They grow on wet and shady (preferably limestone) rocks, in forest or open, shady places; usually in the lowlands. The genus is unmistakable by (a) the unusual leaf arrangement referred to as alternate-distichous, (b) the very strongly asymmetrical leaves, (c) the terminal, unilateral-racemose inflorescences and (d) the blue-white flowers with extremely bilabiate corolla. Union of the former genera Klugia (with four stamens) and Rhynchoglossum (with two stamens) proved necessary when Burtt found intermediate species (stamen pairs with large and small and/or sterile anthers). The genus Rhynchoglossum is particularly interesting for its unusual geographical distribution. The genus is a member of the Epithematoid group of gesneriads, almost all species of which are distributed solely in Asia. 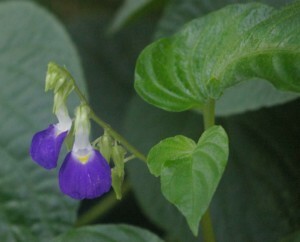 However, one species of this genus (R. azureum) is found in Central America and northern South America. As R. azureum is found primarily near areas of significant pre-colonial human populations, there has been some suggestion that its presence may indicate cross-Pacific migration by humans. But it is equally likely that the original population was a result of wind distribution of seeds, or of plant survival on floating “rafts” of storm debris. R. obliquum has the largest area of distribution in Asia, ranging from north and south India to New Guinea, and reaching also south China in the north. It is remarkable that the presumably most primitive species, R. omeiense is found at the northern and north-western margin of the distribution area (which may be the area of origin of the genus).